I sat in a very heated session at the Postpartum Support International/Marce Conference this morning. Ellen Frank, a volunteer working on the Mood Disorders Committee, spoke with a very passionate group of volunteers and researchers about the upcoming recommendations the DSM-5 will hold for Postpartum Mood Identifiers. After stating there was no clear cut off for risk of onset, Dr. Ellen Frank Ph.D stated the DSM-5 would continue to include FOUR WEEKS as the cut-off date for onset. She later clarified this was due to the additional lack of no clear offset for symptoms in the current body of research. As I tried to wrap my head around this logic, several women, several of my fellow volunteers, survivors, stood to make their way to the microphones placed throughout the room once Dr. Frank bravely opened the floor for questions. What was then witnessed was an outpouring of the angst and horror these women felt in their hearts in regards to this announcement. It simply cannot be four weeks. Four weeks is nowhere near long enough for a Perinatal Mood Disorder cut off. Let’s explore that by creating a time-line of what happens in a woman’s life after she gives birth. A woman gives birth vaginally with or without complications but no surgery. She is in the hospital for 2.5 days. A vaginal birth complicated by a surgical procedure other than D&C and sterilization nets you 3.3 days. A cesarean section with complications earns you 4.6 days while without complications gets you 3.4 days. Now mom goes home right as the Baby Blues peak around day four or five. She may or may not have a significant other or family member able to stay home with her to help with an adjustment period over the first week home. Significant other returns to work. Mom is at home. The baby blues should resolve early in the third week as they peaked at the end of the hospital stay for moms who had a cesarean section with complications. But contradicting recommendations often advise new moms to seek help if Baby Blues last longer than two weeks. Mom is still at home. Lucky if she’s had a shower every day, slept more than 45 minutes at a time, may or may not be dealing with the beginnings of the stress of her new infant on her marriage and home life. The Baby Blues have barely resolved at the beginning of this week if she’s on the longer end of the spectrum. Mom is spinning and has no time to stop and realize that there may be something wrong. In fact, she’s barely unaware that four whole weeks have passed since the birth of her infant as her priority does not involve checking her day planner for the cut-off date for the Four Week Rule. Normal infants do not settle down to sleep regularly until 8 weeks old according to some research. So mom may not even sleeping decently until 8 weeks postpartum or even longer. And we all know what a little sleep deprivation will do for the symptoms of Perinatal Mood Disorders. C-section recovery can take anywhere from 6-8 weeks and may increase mom’s risk for Postsurgical Depression. And last but certainly not least, women in America typically do not go for a Postpartum check up until SIX WEEKS postpartum with the exception of complications developing prior to the expected appointment. By her six week appointment, Mom has had a chance to have the blues dissipate or explode. Mom risks her OB dismissing her symptoms as a Perinatal Mood or Anxiety Disorder if the good folks on the DSM-5 committees have their way. As a woman who was told, by her OB, that because she was more than four weeks postpartum she could not possibly have Postpartum Depression, I am urging the good folks at the DSM-5 to reconsider. My first OB’s rigid belief in the DSM-IV set off a chain of events which would ultimately land me in a psychiatric hospital. You see, he believed that at four weeks, all my hormones got up off their asses and did a happy dance until they were all right back where they belonged. Clearly, the questionnaire on which I had marked having the desire to harm myself AND my infant, meant nothing. Essentially, he sat across the desk from me and agreed I was a little sad but did not feel it rated any additional or insightful training. He did refer me to the in-house therapist. Want to know what they did? They called me and canceled. The third time, I was racing through town with my infant daughter strapped into her car seat as she screamed at the top of her lungs. Screaming at the top of my lungs. The DSM-5 people are wrong. But they won’t know that until you are available and ready to speak up too. First of all, you can go to the DSM-5 evauluation site. Register as a participant. Sign up for notifications if you can do so. Secondly, speak up. Make your voice heard. If you KNOW of research showing the onset of Postpartum Depression beyond four weeks, please, share it with the committee. Dr. Ellen Frank assured us that the work groups READ, SHARE, and DISCUSS every comment received. The Four Week rule is simply not acceptable and we need to fight tooth and nail to get it changed. It’s a very dangerous and irresponsible thing to tell a woman who is possibly on her last string of hope that she’s just fine when she KNOWS, she KNOWS deep down she is not. It’s a liability. It’s just not right. Speak up. GET heard. Make this right. Head over to the DSM-5 website to register as a participant. Speak up. Tell them your story if you were diagnosed after four weeks or if you WEREN’T diagnosed after those four weeks because of the The Four Week Rule. You have an opportunity to really make a change here. This entry was posted in advocate and tagged DSM-5, Postpartum Mood Identifiers on October 29, 2010 by LHale. As many of you know, I am in Pittsburgh at the fabulous Postpartum Support International and Marce Society Conference. My physical journey here started Sunday night when my husband and kids dropped me off at a relatives home in Atlanta so I could catch MARTA (public transportation) to the airport the following morning. But my spiritual journey here started some time ago. The provisions for this trip have been nothing short of astounding. Based solely in faith and prayer, I am so humbled to be here in Pittsburgh at this conference and hosting a special discussion as well. Back in April, my husband lost his job. I was already in discussions with a fellow PSI Coordinator to host a special discussion in regards to encouraging professionals to communicate in order to increase continuity of care for the Perinatal Woman. We moved forward and submitted an abstract in June. I had faith my husband would find a job and we would somehow manage to get me to the conference. On July 4th, I received an email congratulating me on the acceptance of our abstract to the conference (YAY!) and immediately thought, Oh no. Now I HAVE TO GO. I began to pray. I asked others to pray. Then, in August, I went to Austin, TX for a fundraiser. PSI again was involved. On the return journey, I was stranded in the Austin Airport for 6 hours. The next day, I got ahold of Delta on Twitter and they sent me a travel voucher. At the time I had no idea what I would use it for as I was sure I could not afford to fly to Pittsburgh, even with the discount the voucher offered. More and more time went by, I continued to pray and wait patiently. I even set up a donation page but nothing happened there. PSI offers a scholarship to the conference so I applied and received the funds. I now had a partial scholarship but held off on cashing the check because I was unsure if I could still go. Two weeks ago, I began to panic a little. Continued to pray and tried to stay calm. I tweeted and blogged about praying me to Pittsburgh. I emailed my brother. We checked the flights at Delta and lo and behold, found one for just $178 + tax. He paid what my voucher did not cover as a late birthday/early Christmas present. I now had a flight. I received an email from PSI’s awesome Program Coordinator letting me know that there was a Coordinator who had an extra bed I could sleep in for free. I now had somewhere to stay. PSI’s awesome Program Coordinator found two angel donors to cover the remainder of my Conference stay (thank you whoever you are!) and suddenly I was attending ALL days of the conference (including the pre-conference workshops) and going to the banquet. I continued to pray for money for meals not included in the conference and to cover checking my bag at the airport. I mentioned the miracles God had worked so far in my travel needs at my bible study class and only asked for prayer for the remainder of the funds. After class, two of my classmates walked up to me and handed me cash totaling exactly what I would need to cover these costs. I was going to Pittsburgh. This entry was posted in prayer and tagged faith, God, Pittsburgh, power of prayer on October 27, 2010 by LHale. Dr. Shoshana Bennett is seeking stories of recovery for a new project. You are welcome to submit your story directly to Dr. Shoshana Bennett by email her at drshosh@droshosh.com. Your submission should be no longer than two typed pages. Dr. Bennett wants these submissions to cover how you felt at the beginning, during recovery, and then focus on how you feel now as well as any positives in your life now. Is your life better than ever or not? Submissions are due by the end of October. A bit of short notice, I know, but that’s totally my fault. So – if you can get two typed pages together by next Sunday for Dr. Shosh, I know she would appreciate it greatly! This entry was posted in advocate, Perinatal Mood Disorders and tagged Dr. Shoshana Bennett, Postpartum Mood Disorder, Postpartum recovery on October 22, 2010 by LHale. 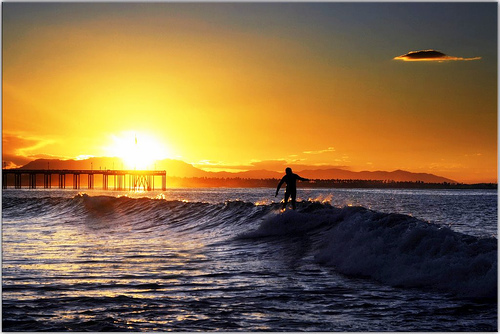 This entry was posted in friday soother and tagged Anne Frank, Ocean, sunrise, surfing, Ventura on October 22, 2010 by LHale. When I was a young girl, I lived in a very rich town. One classmate arrived at and left school in a limo complete with chauffeur every day. Nearly all of my fellow classmates belonged to the yacht club. Lived in a modest three bedroom brick cottage with my awesome parents and pain in the arses but I still loved them to pieces little brothers. Our Dodge truck had holes in the floor board. We used to make a game out of watching the road as we sped over it on our various journeys. We weren’t dirt-poor but we were not over the top obscenely rich either. At least not in the financial sense. Kids being kids, there were some pretty crappy experiences in my childhood. I was often berated for my lack of monetary associated bling. Teased and called “Corroded” as apparently that was the best they could come up with. Several afternoons found me in tears because of something a classmate said to me – and I don’t even remember what it was right now. I learned to think pretty poorly of myself up until the 7th grade. In the 7th grade, I found myself in a new school hundreds of miles away. It was a true blessing. I seized it and “rebranded” myself. I had friends within minutes of my first class starting. Friends who didn’t tease me or make fun of me. Friends who thought it was awesome that the “new girl” was in their class. I soaked it up. Sure, as the years progressed and puberty sprung herself upon me, I found myself in the hot seat again. But I knew it was not me. It was the other people. It hurt, don’t get me wrong but soon I found myself wishing the people who were so very mean to me would be given a chance at a happier life because clearly, they were hurting too. After postpartum, I had to re-learn positive self-talk all over again. I had to learn that I was not a bad mom for wanting to spend time away from my child. That formula feeding did not make me evil. That it was okay to be MY kind of mom – and unapologetically me. That I? Was a beautiful mom no matter what. Remember that as you do today’s challenge. This entry was posted in postpartum depression on October 20, 2010 by LHale. I grew up in a hugging home. We always hugged, said I loved you, laughed, and cuddled. I am glad I grew up this way because it has given me a great appreciation for passing it onto my children and hope that they will too, pass it on to their children. Hugs are such an essential part of the day. I get down if I don’t get my hugs and will often snag my husband in an embrace as we pass by each other in the hustle and bustle of the day. Speaking of my husband, he recently blogged about the importance of hugging over at his place. Three hugs? I can do that. I may even toss in a few more for extra credit! This entry was posted in postpartum depression on October 19, 2010 by LHale. C-Sections and Postpartum Depression: Is there a link? When Theresa over at The Healthy Baby Network asked me to write an article about the potential link between Postpartum Mood Disorders and Cesarean Sections, I was excited as it was a new area of research for me. I started out with the expectation of finding a definitive link. However, I failed to locate just such a link. Many of the research studies swing toward or away from a link. And one review study lacks a conclusive result in either direction. Why is this? Why is there no proven link when repeatedly I have heard from mother after mother who had a cesarean section of the emotional struggles she has faced after the birth of her child? Of the trauma, the disappointment, the disbelief that birth did not go quite the way it should have? Go read the article I wrote for Theresa over at The Healthy Baby Network and chime in with your thoughts. We would love to hear them! This entry was posted in public awareness and tagged birth, cesarean section, Healthy Baby Network, postpartum depression on October 18, 2010 by LHale. 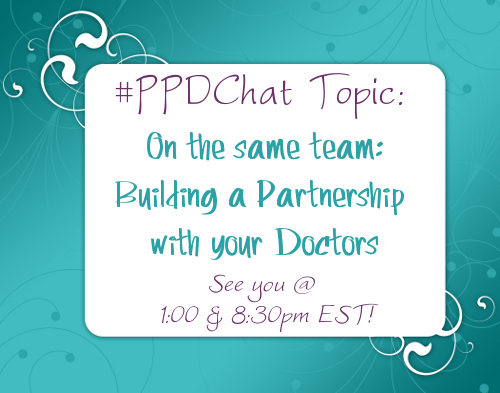 This entry was posted in #PPDChat, advocate and tagged #PPDChat, Doctors, mental health, Patients on October 18, 2010 by LHale. Want to know when my favorite time of day is these days? It is right after my husband leaves to take the girls to school. Our son is still in bed, the dogs are still groggy, and the house is blissfully silent. I sit on the couch, sometimes with my computer, sometimes without, and listen to the silence. Revel in it, almost. I love this silent portion of my day because it allows me to slowly wake up and greet the day. I do not function as well on days when I am rushed out of bed and into life. I need to be able to take it slowly. Sure, I am capable of diving right in if necessary. I simply prefer not to do so. This entry was posted in postpartum depression on October 18, 2010 by LHale. It’s intimidating and scary for some. It was for me. But then we got a Wii and I suddenly was doing this in the privacy of my own home. I LOVED it. And I turned out to be much more flexible than I thought. My aches and pains faded, my need for coffee faded (as I was doing it right after rolling out of bed in the morning), and my body grew stronger and stronger the more I practiced my yoga. On days I did my yoga, just as with sleep, I was happier, peppier, stronger, and much less short-tempered with those around me. Yoga, in a word, is miraculous. I strongly recommend it for anyone needing to take some time for themselves. Now, if you’ll excuse me, I have a date with the crocodile pose. This entry was posted in postpartum depression on October 17, 2010 by LHale.